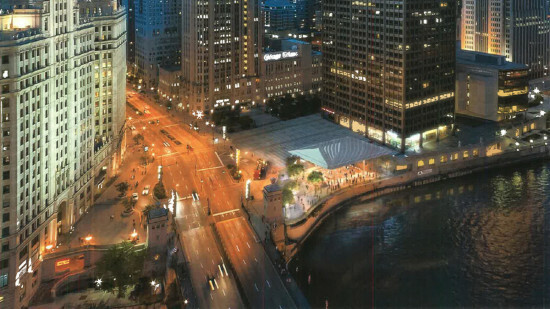 Foster + Partners has revealed initial images of a proposed Apple store at the intersection of Michigan Avenue and the Chicago River. The new store will replace their existing Michigan Avenue flagship store six blocks to the north. Echoing the company’s 5th Avenue store in New York, the design calls for a large, mostly glass structure with an expanded retail space below ground. Unlike the 5th Avenue store, and more akin to Foster’s recent Aix-en-Provence, France Apple iteration, the new Chicago Store will feature a light solid roof suspended on two large columns. Located on, and below, Pioneer Square, the store will have one of the most visible locations in the city, surrounded by some of Chicago’s most iconic architectural landmarks. 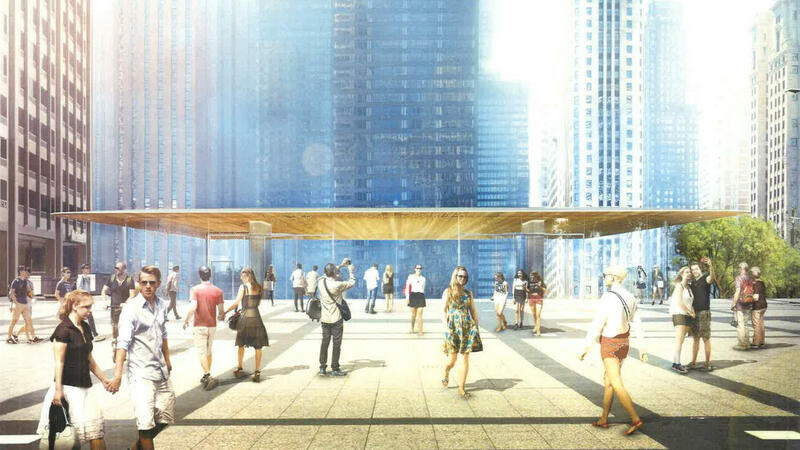 The square itself is flanked by the Tribune Tower to the north, the modernist Bruce Graham designed 401 North Michigan Avenue (formerly the Equitable Building) to the East, and the Wrigley Building immediately across Michigan Avenue. 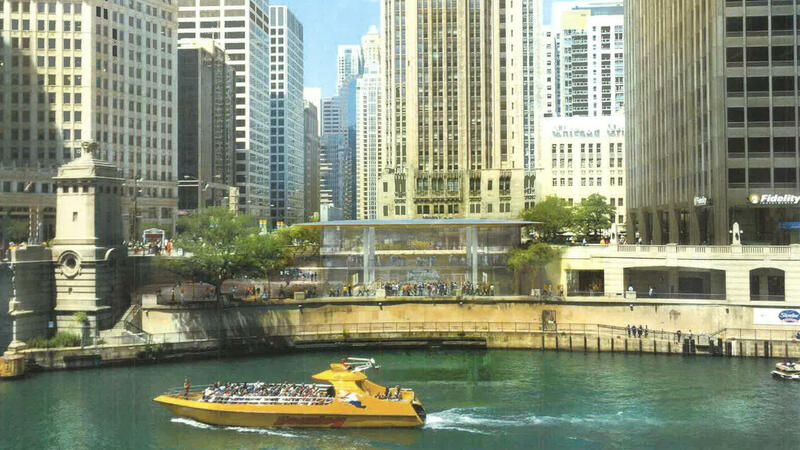 The view up the river to the west will also include the Trump Tower, Marina City, and Mies’ AMA Plaza (formerly IBM Plaza), making this location one of the most recognized tourist, not to mention retail, locations in the city. 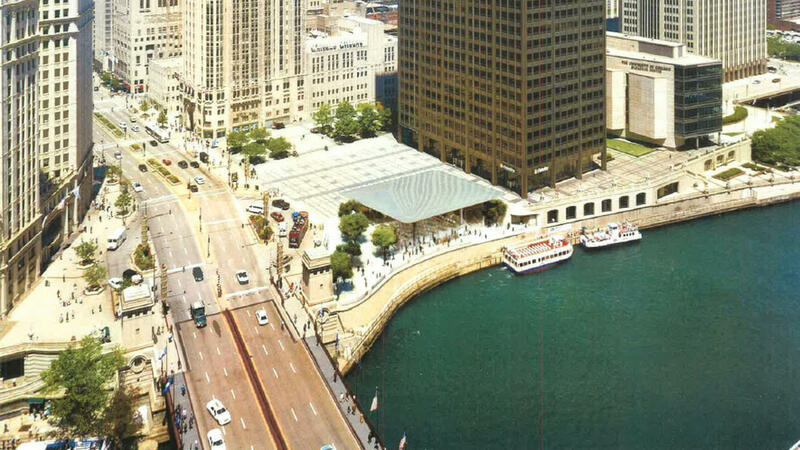 The 20,000-square-foot retail space will occupy an unused cafeteria at Lower Michigan Avenue. The store will also engage with the infrequently used Riverwalk along the north bank of the river. 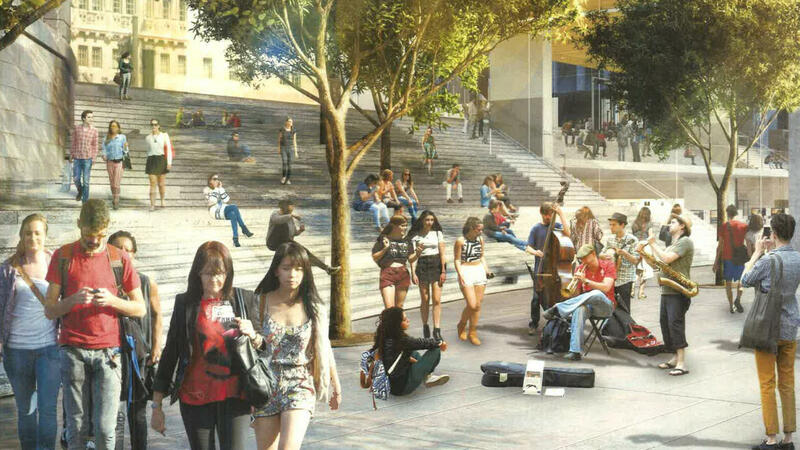 New balustrades and stairs will be added, as well as the 34-foot-tall glass wall of the store itself. 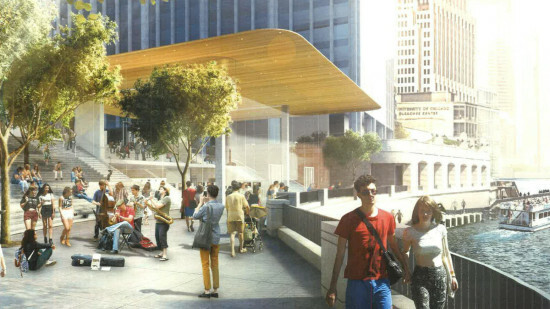 According to representatives from Foster + Partners at a recent courtesy presentation to the City Planning Commission, there will be no retail at the surface Pioneer Square level, with the 14-foot-above-grade glass structure acting as a grand entrance. The city has already approved the project, and construction is planned to begin next year.